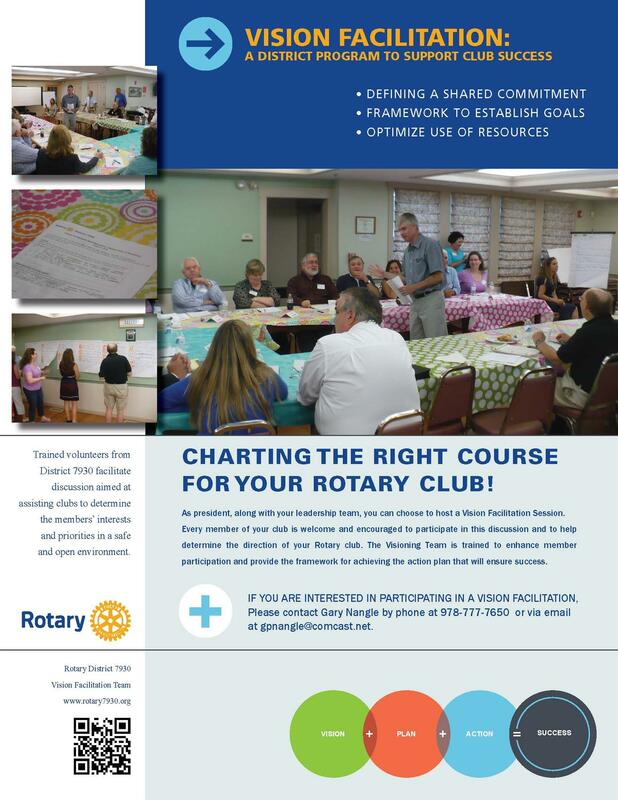 The Visioning process is designed to help a Rotary Club create its own vision and to discover for itself the steps necessary to achieve that vision. The result is unique to each club because this is not a vision decided by District 7930 or by Rotary International. The result is a vision designed and endorsed by the club’s own members. A Visioning event brings together a good cross-section of its membership from the newest to the most experienced Rotarian. The process uses the talents and life experience within the club to develop a vision and goals reflecting that club’s membership. A Visioning event provides renewed focus on objectives and is completed in a dedicated, fun-filled three hour session. The challenge during this process is to gather as many ideas and opportunities for the future from a group of 15 to 30 Rotarians and then condense it down to the most important goals as determined by that club. To make sure that all of this can be accomplished within a limited time frame, the Visioning event is run by a neutral team of District 7930 Rotarian facilitators. The team has been well-trained in a specific process to help the club bring out its best thinking. The facilitation team does not suggest or promote projects. This is not a strategic planning process. However, it does provide wonderful material that can be used to either help review an existing club’s strategic plan or help in the development of such a plan at a later time. If a club starts with an effective visioning event, it leads to a long range plan that can effectively result in programs locally and internationally. A Club Vision is a living management tool that begins this process by defining a shared commitment, providing long term direction, creating a framework to establish goals and objectives, and helping the club to optimize the use of its resources. If you would like more information on the Visioning process, feel free to contact Committee Chair Gary Nangle at 978-777-7650, or gpnangle@comcast.net. Click here if you would like a copy of the flyer!